Heat oven to 350°F. In shallow dish or pie pan, mix butter and red pepper sauce. Place bread crumbs on sheet of waxed paper. Dip each chicken tender in butter mixture; roll in bread crumbs to coat. Place on ungreased cookie sheet. Bake 15 minutes, turning once, until chicken is no longer pink in center. Meanwhile, divide salad greens and tomatoes evenly onto individual large salad plates. 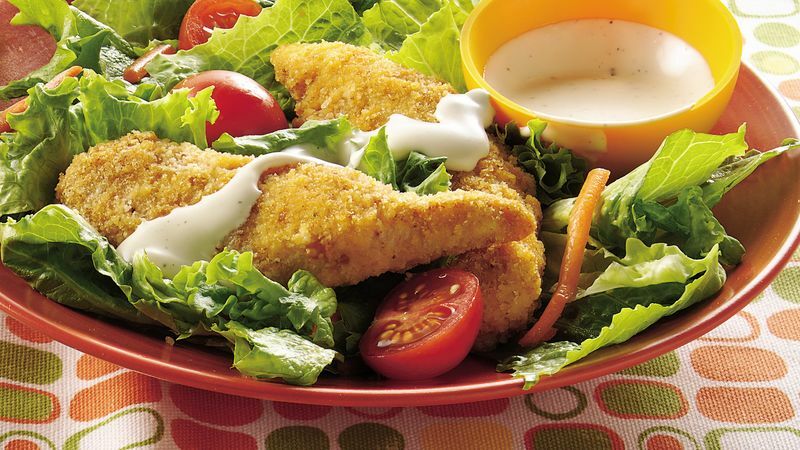 Top each salad with chicken; drizzle with dressing. For a crunchier version of this salad, add 1/2 cup sliced celery. Serve the salad with French bread and a glass of iced tea.